Wow! What a way to get away from it all. 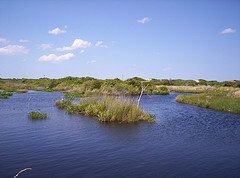 Back Bay Wildlife Refuge is a beautiful, serene place for a family adventure vacation. This stunning wildlife preserve provides a sheltered home for migrating and wintering birds. Located 18 miles south of Virginia Beach, Back Bay has nearly 8,000 acres of marshes, sand dunes, beaches, and ponds. It's home to 300 species of birds, as well as deer, mink, river otters, turtles, and other creatures (snakes too, so stay on the paths!). You can walk or bike 5 miles of trails;you can also boat or fish with a license. Note: This is a refuge, so there's no sunbathing, swimming or surfing. Just bring your bug spray (during the summer season-- expect lots of nasty little mosquitos to be ready and willing to feast on you otherwise) and enjoy some nature and solitude...and possibly the most peace and quiet you're likely to find on earth. To get there from the Virginia Beach resort area: Take General Booth Blvd. to Princess Anne Road to Sandbridge Road; then follow the signs. The Visitor's Center is open 8-4 weekdays, 9-4 weekends; closed Saturdays December-March. Closed holidays except Memorial Day, July 4, and Labor Day. Trails are open daily from dawn to dusk. Fee: $5 per vehicle or $2 per bicycle (if you ride in) April 1-Oct. 31. Free Nov. 1-March 31 (only 1 mile of trail is open in winter). Here's what you need to know before planning your visit to Back Bay. Back Bay doesn't actually have camping facilities. To camp nearby, you'll need to go to False Cape State Park, the most remote park on the eastern seaboard, which is accessed through Back Bay. There, you'll be REALLY able to experience nature the way Mother Nature intended it, in a place hardly changed since Pocahontas graced the shores of Virginia. 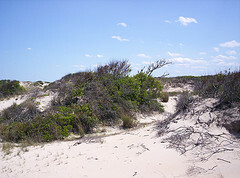 Click here for information on False Cape State Park. After Back Bay Wildlife Refuge, where else should you go in Virginia Beach?